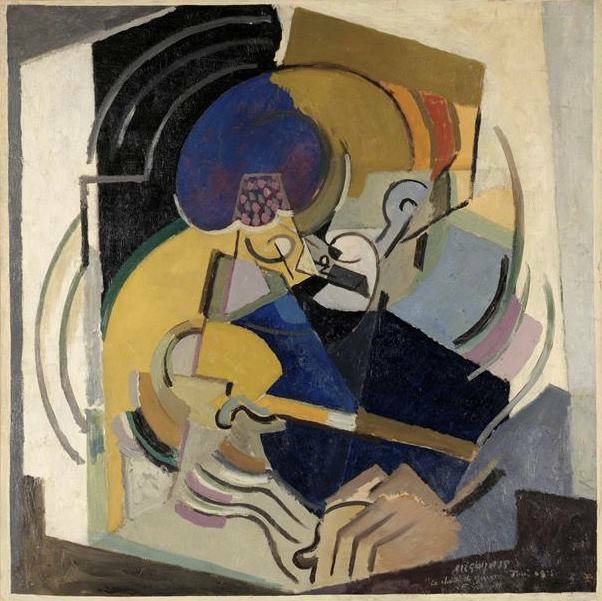 Chant de guerre, a 1915 oil-on-canvas portrait of Florent Schmitt painted by Albert Gleizes, the famed cubist who created several portraits of the composer. This painting is the artist’s rendition of Schmitt conducting the premiere performance of Chant de guerre in Toul, Lorraine in January 1915. 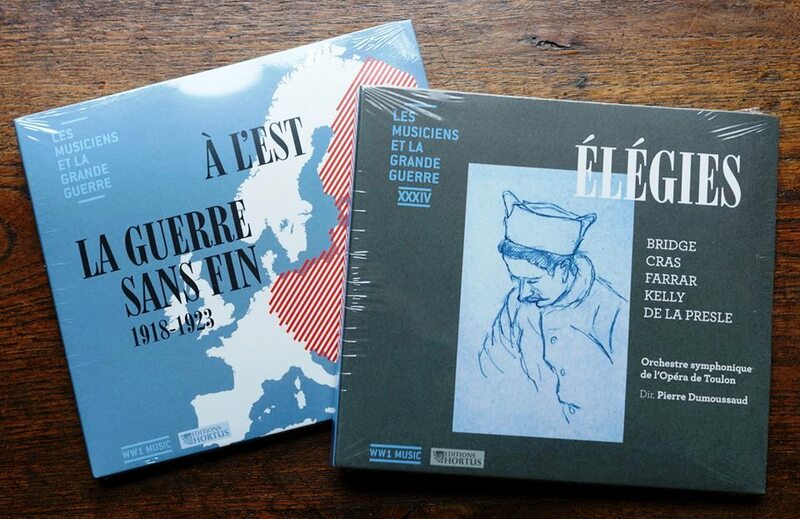 One of the most artistically significant and vital projects to come out of the commemoration of the 100th anniversary of World War I is a group of 35 recordings published by Editions Hortus in its Musiciens et la Grande Guerre series. These recordings have been issued over a five-year span – each one based on a theme and containing selections from a transnational group of composers. The musical landscape covers both sides in the conflict (the Allies and the Central Powers) and embraces a wide range of instrumental and vocal forces. The music of no fewer than 120 composers is included in the series, with many of the pieces featuring instruments that would have been found at or near the front lines of the conflict. Of particular interest to readers of the Florent Schmitt Website + Blog are two pieces by the French composer that are contained in the series – his Chant de guerre, Op. 63 (composed in 1914 and first performed in January 1915), and the Légende, Op. 66 (composed in 1918 and first performed in 1919 shortly after the war’s end). Schmitt composed his Chant de guerre upon the outbreak of war between France and Germany in the fall of 1914. It was a conflict that would soon sweep up nearly all of the younger generation of French musicians to one degree or another. Schmitt was to spend two years at the front, as did other composers such as Maurice Ravel who famously served as an ambulance driver. One of the most tragic consequences befell the composer Albéric Magnard, who was burned alive in his manor home in Oise — along with irreplaceable unpublished scores — upon orders of a German army officer after Magnard had shot and killed a soldier trespassing on his property. 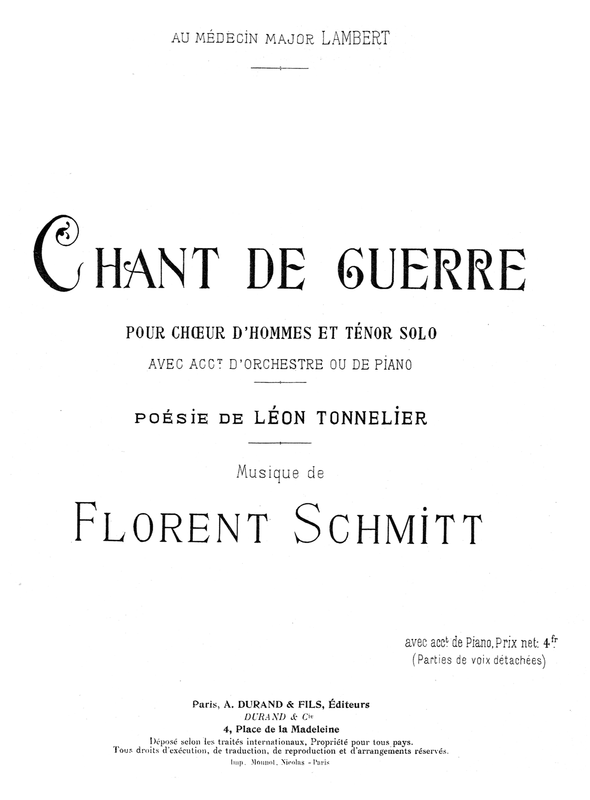 The original score to Florent Schmitt’s Chant de guerre, published by Durand et Cie. (1915). Having found the Chant de guerre recording particularly rewarding – and the entire Grande Guerre series for that matter – I made contact with Emmanuel Pélaprat, who had prepared the chamber arrangement of Schmitt’s composition for the Hortus recording (the composer’s original scoring is for large orchestra, solo vocalist and mixed men’s chorus), to learn more about the project and how it came together. Emmanuel Pélaprat is true renaissance musician. He is a well-known advocate for harmonium d’art instruments, but he’s also a multi-faceted artist whose interests and activities go well-beyond simply that one instrument. A keyboard artist whose teachers have included Jan Willem Jansen (harpsichord) and Michel Bouvard (organ), he also studied music analysis at the famed Paris Conservatoire where he earned two diplomas and five Premiers Prix. 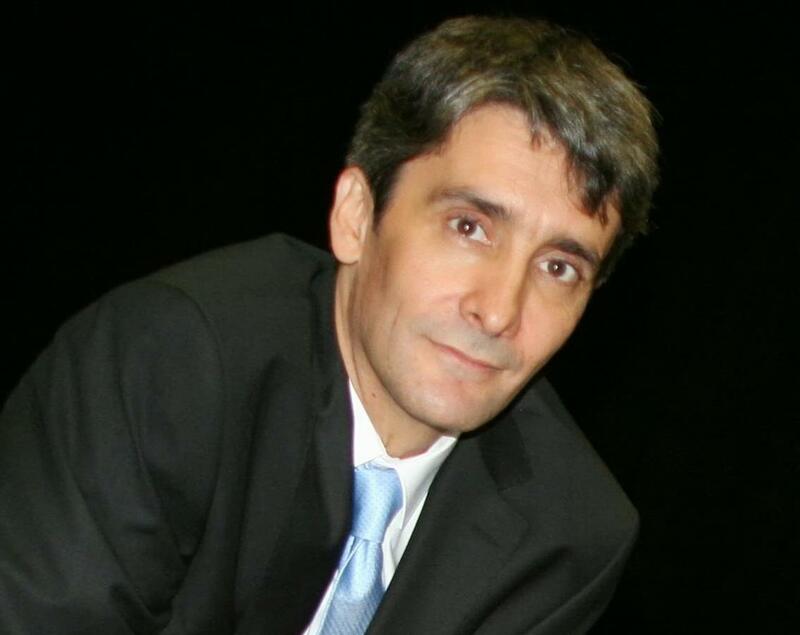 A researcher as well as a performer, Mr. Pélaprat has studied and written extensively about the French composers Aymé Kunc, Benjamin Godard and Florent Schmitt, and at present is completing his doctorate focusing on harmonium d’art music history and performance. He is also preparing a new edition of sheet music originally issued by harmonium instrument maker Mustel more than 100 years ago. In addition to these activities, Emmanuel Pélaprat is a faculty member at the University of Bordeaux Montaigne, has répétiteur duties at several opera companies, and serves as an organist at the parish of Notre-Dame du Taur in Toulouse. … All of which made me grateful that Mr. Pélaprat was able to take time to talk about the Grand Guerre project – and specifically about the pivotal role he played as artistic director of the particular volume that featured the premiere recording of Florent Schmitt’s Chant de guerre. Highlights of our very interesting discussion are presented below (Mr. Pelaprat’s remarks have been translated from French into English). PLN: The series “Musicians and the Great War” by Editions Hortus that covers music related to the First World War is fascinating scholarship and makes for essential listening. How was this project conceived? EP: The project was initiated and carried out by Philippe d’Anchald and Didier Maes, the two gentlemen behind the Hortus publishing firm. The centenary of the Great War sparked many commemorations throughout Europe in particular, and it was important that music should not remain on the sidelines during these events. The Great War also marked a turning point in the history of music in many diverse ways, and the series shows how important those changes were to music development and our musical language today. The collection is a unique production; nothing else like it has been carried out connected to the First World War. Because of its high standards of quality, it has garnered immediate and universal critical acclaim, including receiving the Label Centenaire award from the Mission du Centenaire [Mission du Centenaire de la Première Guerre mondiale], created by the French Government. PLN: It’s interesting to see that some of the music recorded in the Grande Guerre series comes from well-established composers, whereas other composers are barely known. How were the pieces researched and chosen to become part of the series? EP: This is a central part of the mission of the project; it was essential to bring to the attention of the public music that’s never played or recorded, as compared to better-known scores. If the project had been focused on famous works, the series would not have had the importance – or the interest — that it has generated. Another important mission of the collection was to cover as much as possible the many nationalities of the composers in order to offer the widest possible panorama of music. This was a “world” war, after all. PLN: Each of the 35 volumes in the series has a particular theme or focus. How was this strategy formulated and implemented? EP: The strategy was quite interesting – and also quite practical. Each volume in the series was entrusted to a musician who took on the role of artistic director for that particular recording. Generally, the repertoire in each recording is oriented around a particular instrument or instrumental formation. Chamber music and vocal music with piano are the most represented genres, although other recordings range from solo keyboard instruments like the piano and organ all the way up to orchestral compositions. One of the successes of the series, I feel, is to have been able to involve so many different musicians – each of whom brought their own distinct personality to the realization of their particular recordings. PLN: Florent Schmitt’s Chant de guerre appears in Volume 11. Can you tell us about this particular volume of the series, and its theme? EP: Yes, I was the artistic producer for that recording. When Hortus contacted me, they wanted to honor the harmonium – an instrument for which the music literature is abundant between the years 1900 and 1920. There was plenty of material to make a solo harmonium recording around the repertoire related to the Great War — but, apart from a relatively few compositions such as those by Sigrid Karg-Elert, solo harmonium works are pretty much confined to the realm of sacred music. Interestingly, the harmonium was originally conceived as a living room instrument, rather than one for the church. But because of its musical qualities, its success has been so great in church environments that today most people associate the harmonium with sacred music. 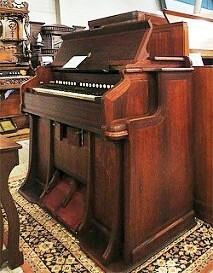 Despite its church “reputation,” It should be pointed out that the majority of the repertoire for harmonium consists of transcriptions – often with piano but sometimes with other instruments. Back in the days before gramophone players, these sorts of transcriptions allowed for creating an “orchestra in the living room.” Playing the symphonic repertoire in this fashion took on another, more broad dimension compared to the usual transcriptions for piano four hands, for instance. It was those expressive qualities of the harmonium that interested me greatly, and I wanted to put that forward in this volume of the series. Having this freedom and variety — but staying in the tradition of transcriptions for the instrument — is what I created with my Ensemble Double Expression [Sandrine Chatron playing harp, Jérôme Granjon on piano, and Emmanuel Pélaprat on the harmonium] and in the pieces that make up the recording. The disc opens with Chant de Guerre by Florent Schmitt and closes with a work by Aymé Kunc, a near-contemporary of Schmitt who won the Prix de Rome first prize for composition in 1902 (two years after Schmitt) — two men who were well-acquainted with one another. Kunc is a composer I have focused on for a long time now – a musician from Toulouse like me. Kunc’s Pensée musicale, composed in 1916 for the war’s deceased musicians as memorialized at the Champs d’Honneur, is not the least bit heroic-sounding as it was scored by the composer for harp and orchestra. In the version on our recording, the presence of the harp was melded with the piano, with the harmonium covering the orchestral parts. The vocal part was also part of Kunc’s original score; it was written expressly as a soprano vocalise, in contrast to Schmitt’s Chant de guerre where the choice between using a solo tenor or soprano is left up to the performers. Illustrating this, the premiere performance of Schmitt’s piece at the Théâtre de Toul featured a tenor soloist, whereas the Paris Opéra premiere featured a soprano instead. 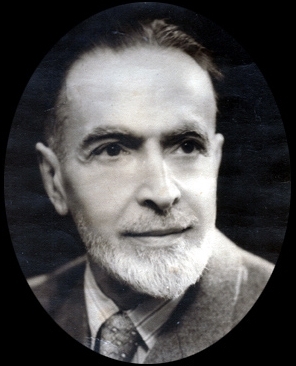 As for the remaining works on the recording, the choice of pieces for solo harmonium was intended to be representative of the kind of secular music typically composed for it. So we have Karg-Elert, who was the most prolific composer for the harmonium. He had composed a collection of eight harmonium pieces during the war years titled Innere Stimmen, which are very varied. In the case of the Belgian composer Joseph Jongen, here one finds a beautiful example of the religious repertoire that I mentioned before – in a piece titled In memoriam. At the center of the disc is the Pagine di Guerra by the Italian composer Alfredo Casella for piano four-hands. These are in a very different, more modern musical language – conceived as they were to accompany documentary film footage from the front lines. PLN: As you’ve noted, your recorded rendition of Schmitt’s Chant de guerre calls for a different instrumentation from the composer’s original score. What was the rationale for preparing the alternative scoring? Chant de guerre, Albert Gleizes’ 1915 portrait of Florent Schmitt, was featured on a French postage stamp issued nearly a century later (2012). EP: I would have liked to record the original version of the Chant de guerre, but it is a composition that requires a large orchestra, a vocal soloist and a men’s choir. This was impractical to arrange, but I didn’t want to lose the opportunity to present this important piece for the first time on recordings. Although I quite liked Schmitt’s own version of the piece for piano and vocalist, I decided to create a new transcription for the Ensemble Double Expression – in a style that could have easily been done back in the days of the First World War — because it provided an opportunity to present the piece in a character that is closer to Schmitt’s original conception of the music. The basic principles of transcription writing are quite clear, and I’ve adhered to them here. The vocal lines are unchanged and given to the soprano, which was sung on our recording by Sonia Sempéré. I’ve kept the harp part from Schmitt’s original orchestration nearly intact. For the most part, the piano is a reduction of the string parts, while the harmonium takes charge of the woodwinds and brass. In other words, not one note has been eliminated; only the original colors are different due to the change in instrumentation. 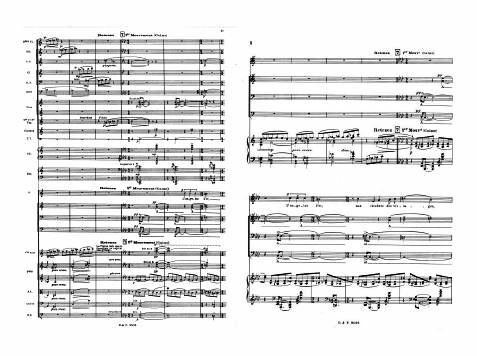 A comparison of three versions of Florent Schmitt’s Chant de guerre: Pictured above left are the beginning measures of the re-exposition in Schmitt’s 1914 full orchestral/choral version of the piece. Above right is the same place in the score showing the composer’s 1915 piano/vocal reduction. Pictured below is Emmanuel Pélaprat’s transcription for soprano, harmonium, harp and piano — created 100 years later (2015). 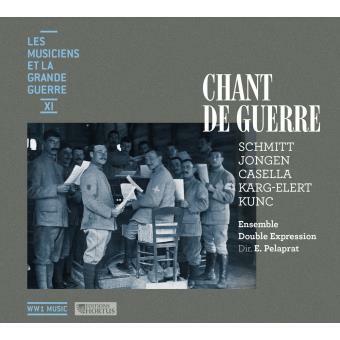 PLN: What were your specific responsibilities pertaining to the preparation and recording of Chant de guerre? A vintage Mustel harmonium (early 1900s). EP: As the artistic director for the recording, in addition to concepting the program and preparing the musical transcriptions, I was responsible for organizing rehearsals with instruments that do not transport easily and that also involved performers who live between the South of France, Paris and Amsterdam. There was also the challenge of the instruments themselves, which are period pieces. We used my own 1898 Mustel harmonium and my 1899 Érard grand piano. 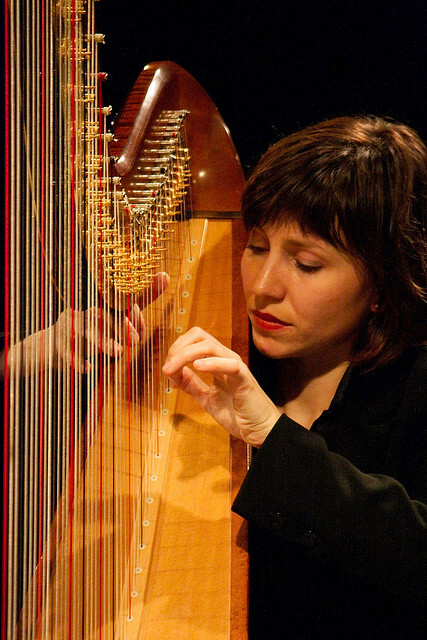 We were successful in locating an older harp, too [a 1912 Érard model] – thanks to a friend of our harpist, Sandrine Chatron, who performed on this type of instrument for the very first time in our recording. We recorded in the town of Cahors, where the mayor was kind enough to place the city’s auditorium at our disposal. Lastly, I was responsible for the editing work before the finished recording was heard and validated by all the musicians. 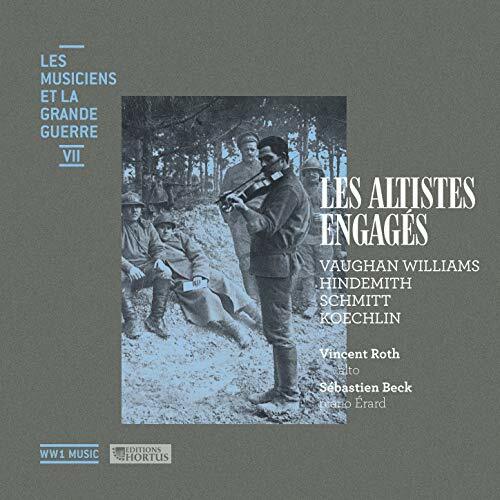 PLN: Did you have similar responsibilities for other pieces of music in the Grand Guerre series of recordings? EP: No, I did not deal with other volumes in the series except occasionally to find and provide a score or discuss repertoire with the executive producers. I have, however, provided artistic direction and written program booklets for other Hortus recording projects. 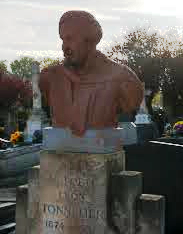 PLN: Another composition of Florent Schmitt – the Légende – is included in Volume 7 of the series. This piece is usually performed with a saxophone soloist, but in this recording the solo instrument is a viola. What was the reason Hortus recorded the version containing the viola? 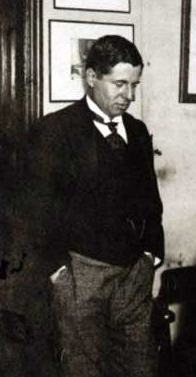 EP: Florent Schmitt composed the Légende in 1918 for alto saxophone and orchestra at the request of the American saxophonist Elise Hall (who also commissioned the Rhapsodie of Debussy). 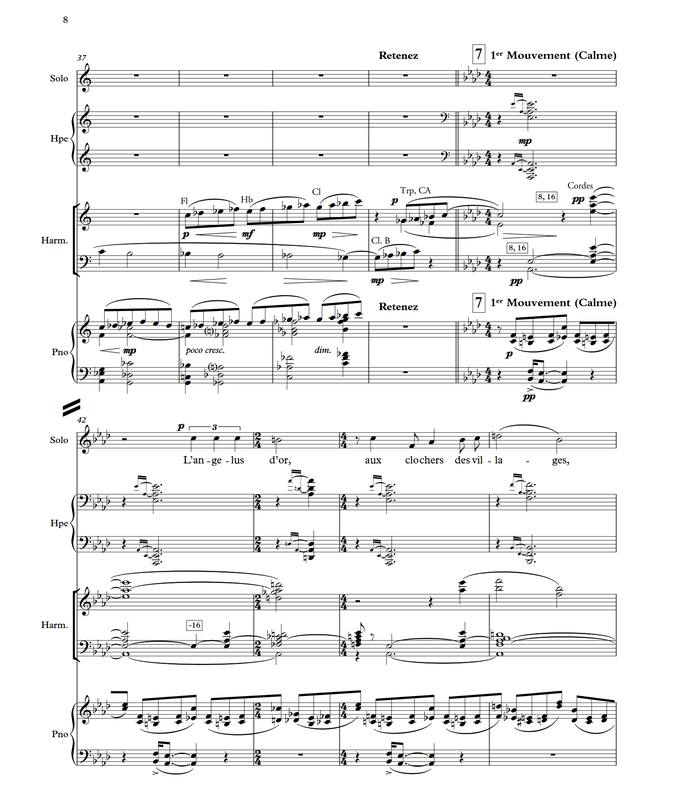 But in the published edition of the score, there is also mention of the solo viola — which even becomes the priority instrument so-labeled in the orchestral edition of the score that appeared in 1920: “Legend for viola (or alto saxophone) and orchestra” as the published score states. Later still, the violin was added as another option for the solo instrument. From this, we know that the saxophone was not necessarily the composer’s preferred solo instrument in this piece; in fact, the premiere performance of the music was given by the violist Maurice Vieux at the Concerts Pasdeloup in 1919. In the Hortus project, Volume 7 on the series was entrusted to the violist Vincent Roth, so it was only natural – as well as wholly legitimate — that he offered the piece in that form and performed as the soloist on the recording. PLN: The Hortus series now numbers 35 volumes. Are there other volumes planned or is the series now complete? EP: The series is now complete at 35 recordings. It is quite an accomplishment! The project called for an unprecedented commitment from the executives of the Hortus publishing company and from everyone else involved in the effort. We’re all grateful for that commitment – and for the excellent quality of the series. PLN: You have had a particularly interesting and varied musical career. Please tell us a little about your background. EP: I think what describes me best in my musical journey is my penchant for discovery – and in particular my interest in music of the late nineteenth and early twentieth centuries which is such a very rich period for the arts. Deeply in love with the heritage that surrounds me, I try as much as possible to defend and promote French music, often regretting that many French musicians do not pay enough attention to it. Having focused on the piano initially, I then turned to harpsichord and organ. I am also passionate about creating music. I worked hard at my training, and today I am fortunate to be teaching composition at the Université de Bordeaux Montaigne. But I must say that when I discovered the harmonium d’art, for me it was a synthesis of everything I love: I was in my favorite era, with a heritage instrument and exploring quality repertoire in need of rediscovery. The interest aroused by the harmonium is palpable, and I wish as best that I can to contribute to a better knowledge and understanding of its musical qualities and significance. PLN: What exposure to the composer Florent Schmitt did you have before working with his music for the Hortus series? EP: Florent Schmitt is one of my favorite composers – and has been for many years. When I was studying at the CNSMDP [Paris Conservatoire] in my music analysis class, I had made a presentation on Schmitt’s Psaume XLVII and also achieved my prize with an analysis of La Tragédie de Salomé. 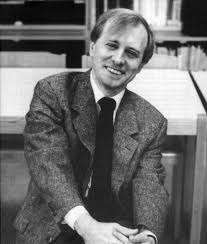 At the time – it was in 1997 — some teachers at the Conservatoire tried to dissuade me from selecting that topic because it was not “fashionable,” but the head of the class, composer Alain Louvier, encouraged me — and as it turned out, the jury was particularly interested in the work! PLN: What other notable recording projects have you worked on recently or are planning for the future? 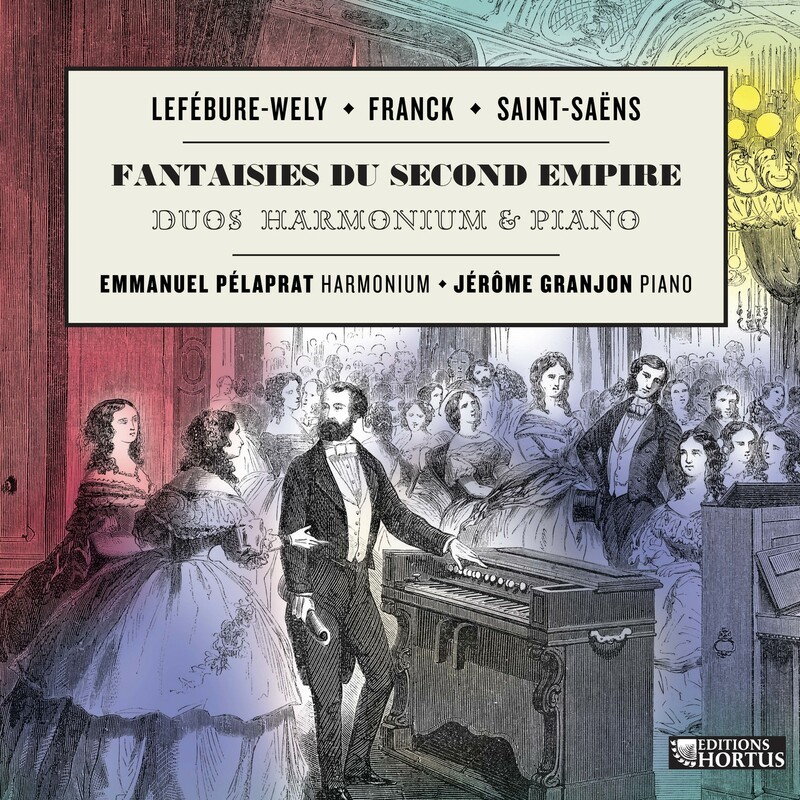 EP: With the pianist Jérôme Granjon, I have recently released a disc devoted to French piano duo-harmonium music of the Second Empire era. As part of that project we recorded the Six duos of Saint-Saëns, the Prelude, fugue et variation of Franck, and a sonata by Lefébure-Wely that I discovered in 2012. The recording has been very well-received by the press, earning five Diapasons. The next project is devoted to more music by Saint-Saëns. PLN: Where can music-lovers go to find out more about the Hortus Grande Guerre series? EP: There are website pages devoted to the series which are well-worth investigating for the wealth of information that is there. I encourage everyone to visit and explore! Those interested in the music of the early 20th century should definitely investigate the entire Editions Hortus Grand Guerre series and the wealth of musical riches it contains. Emmanuel Pélaprat on the air at Bordeaux Radio. 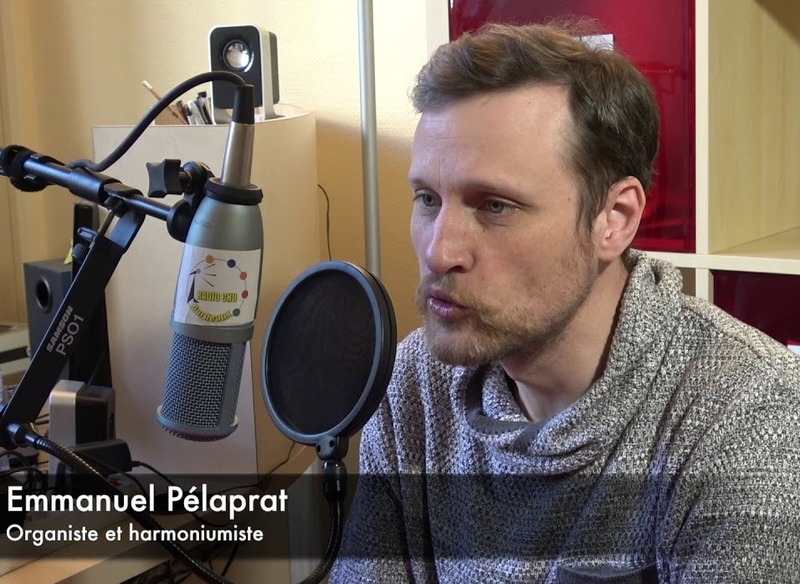 As for Emmanuel Pélaprat, he was interviewed recently on Bordeaux Radio – a fascinating discussion that was video-recorded and can be seen here. In addition, he was a featured recitalist at the 2016 Bern International Harmonium Festival in Switzerland, where his idiomatic and captivating performance of two movements from Rudolf Schartel’s Romantische Studien can be viewed here. This entry was posted in Chamber Music, Composers, French Composers, Instrumental Music, Organ Music, Vocal Music and tagged Alain Louvier, Alberic Magnard, Alfredo Casella, Ayme Kunc, Benjamin Godard, Chant de guerre, Didier Maes, Editions Hortus, Elise Hall, Emmanuel Pelaprat, Florent Schmitt, Jerome Granjon, Joseph Jongen, Lefebure-Wely, Legende, Leon Tonnelier, Mission du centenaire, Musiciens et la Grande Guerre, Mustel, Nick Barnard, Philippe d'Anchald, Sandrine Chatron, Schmitt, Sigfrid Karg-Elert, Sonia Sempere. Bookmark the permalink. 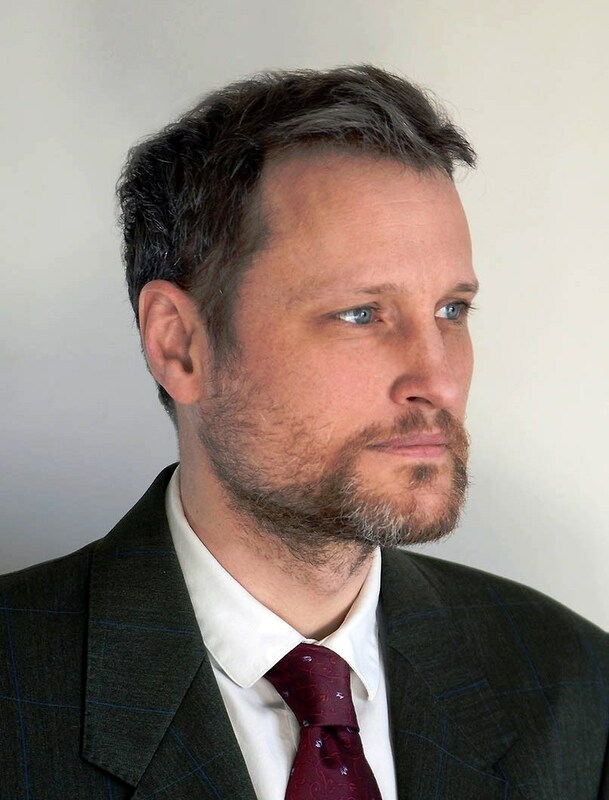 « Six important compositions of Florent Schmitt to be featured in the upcoming 2019/20 concert season by orchestras in Antwerp, Augusta, Buffalo, Hiroshima, Montréal, Perth and Québec City.